Greek is a pretty, light Magento fashion theme that is great for customers and fashionistas. It is fully responsive and function-ready, with ready-to-go advertising space in static blocks. Greek magento theme is a design with the combination of 2 basic colors : black and white. It’s not only elegant but also quite luxurious. You will be attracted at the first time when you see this template. It has 6 pre build home page layouts. 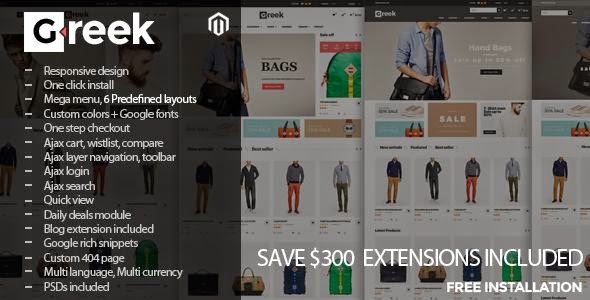 Item Reviewed: Greek Simple and Clean Responsive Magento Theme 2015 9 out of 10 based on 10 ratings. 9 user reviews.